Wouldn’t it be cool if there was a list of pitch deck rules? Let’s face it, there’s just so much you don’t know you don’t know and you keep reading there are these unwritten rules you need to pass or you aren’t getting a dime in your fundraising. It’s a lot of stress and you don’t have time to mess about since people are counting on you. Let me be clear here there is no ideal content. There are 100 ways to tell your story the right way and a million to do it the wrong way. We want to avoid the later. Yes. You can do it right, you just need guidance to know when you have gone off the rails. Less is more. There is a lot of greys and so I’ve made 16 pitch deck rules to help you be a hero and not a zero. Loose lips sink ships — Be succinct. More text is bad. Less is good. Space is beautiful. An investor needs to be able to tap down on your pitch deck continuously every 3 seconds and be able to provide an opinionated summary of what it is your startup does and intuitively whether this is a company they need to keep looking at. This has been written in more detail here. This test is critical as the investor will decide to either read your deck properly (for the first time) or delete it. The investor must be able to tell you the message of the slide by having looked at it for only five seconds. If you have plastered the page with as many facts and words as possible… this will not be possible. What is critical therefore is that you explicitly state the message of the slide in the header. You must understand where the eyes will sequentially follow (and control this with font size and exaggeration). If the reader is unable to quickly understand how to read the slide, they will need to move on. If you only have t=x seconds… how would you prioritize the information you provide? No seriously, if you have 3 seconds do you have time to meander and waffle? No, dude. No. Get to the point. In fact, always get to the point! You need to be situationally aware of how you communicate information to people depending on how much time you have. If someone asks ‘so what do you do’ at an event you don’t talk their ear off for 10 minutes- no you give it to them straight. If you are on stage and you have 3 minutes, you need to explain your startup in a different manner. You need to write down and learn variations of your pitch depending on how much time you have. You do not get ‘bonus time.’ No, whoops I forgot to explain what we do, or I forgot to explain how we make money… Cover what matters in the time you have. Yes, you need to be able to pitch someone in the time you have in an elevator, but this isn’t that. After you pitch the partner, the partner can meet another partner in the elevator and be able to explain what you do and why it is interesting in under 30 seconds (without you there!). If you have passed all the tests then this is the ultimate one. Can the partner you pitched, repitch you to another? The ultimate high stakes game of Chinese whispers. What is your insight; behavioural or technical, that implies this business is going to work where others have failed (or not bothered even trying?). To get a big result, you need to do things differently. You want to channel your inner Peter Thiel here (Ideally not with a stance of supporting the Donald). What is your contrarian thought? Yes, timing matters a lot here! Now you only want to have one, otherwise, you’re just being combative and you won’t keep on track. Don’t forget you are doing sales here. Your deck is marketing material. You have 30mins/hour to get a soft yes. Tease with your depth, but keep the debate in the shallows. You also want to have one profound thought as you are going to need to back that up! You have limited time. So with three reasons, why is your perspective correct? The pitch deck rule of 3 applies to everything when explaining things to people (selling, pitching etc). You can always make 3 key points. People like 3. When pitching investors, make sure whatever happens that when the investor leaves they are able to remember three really important things about your business. You have the opportunity to control what 3 things! Maybe you want to repeat them at the end of the deck? These three things need to be compelling enough to fascinate investors to need to be a part of it. Don’t forget, they’re going to explain to their investors (LPs) why they invested in you… with maybe three key reasons. This is pretty simple. GMV, Revenue, EBITDA. Then add gross margins, growth rates, or something relevant to the stage and type of business you are operating. Ideally, there are around 4 key headline numbers in bold, and then any other line items are meta ones… pertaining to growth and profitability. You want to show strong unit economics. This is not a slide to put numbers for numbers’ sake. Again, each slide is for sales. So pick numbers that support your sales effort. If you have a lovely neck nice, put on pearls. If you have epic legs, put on them blue jeans and twerk ’em. Accentuate your assets. If you don’t invent the boogyman in the closet, the investors will invent their own. Fear is one of the biggest reasons investors don’t invest. His name is Rumpelstiltskin. Names have power. There are two main emotions, greed and fear. If you don’t address the fear, the investors will make up their own mind and you won’t have the opportunity to allay those fears. You want to have control over everything possible. You have thought through problems and have thought of ways to manage risks. You have contingency plans. For every problem that might come up, you have thought them through. There are always curve balls coming. Investors want to know you have practised for more than the fastball. Every deck needs its own story. People crave stories as they are more relatable. This is an incredibly profound pitch deck rule. Safra Center fellow Michael Jones asserts you don’t even have to have a perfect story: “even if the narrative is incomplete in a news story, people will fill in the blanks with what they already bring to the table.” What matters is you tell a story. Investors think they are smart. Let them feel smart by ‘knowing what you are talking about’ without spelling it out. It’s like letting them think it was their idea. Nassim Taleb indicted our human tendency to link events by creating stories that explain them, the comfort we derive from thinking we understand why something happened if we make a story out of it. By telling a story, you allow investors to construct an internal dialogue as to why this makes sense. As E. M. Forster wrote “The king died and then the queen died is a story. The king died, and then the queen died of grief is a plot.” It’s this plot that people actually think is more likely (even though it is statistically unlikely). Telling a story makes whatever you say in the narrative far more plausible. If you have facts, show them, if you don’t, then tell them. Showing is better. If you have the best team in your category, how can you show that? You can illustrate achievements, right? If you don’t have the best team… you write ‘we have the best team.’ And yes, no founder ever writes ‘our team is below average.’ Investors look passed telling when you should be showing. Every time you show you build credibility currency. Every time you tell you create more required leaps of faith. Investors have no faith. Appearances can be deceiving; this can be used to your benefit. To give an esoteric, but a prescient example; using a weird font can make your deck harder to read and subconsciously give investors the impression your business is hard too. Hyunjin Song and Norbert Schwarz in The Psychologist demonstrated that fonts can significantly influence people’s assessment of how easy or difficult things are to do! When Song and Schwarz presented these exercise instructions in Arial, readers guessed that the exercise would take 8.2 minutes to complete. When presented the identical instructions in Brush Script MT (which wasn’t quite as hard to read as in this technologically-constrained example), they guessed it would take 15.1 minutes. Plus they were more willing to incorporate the Arial-presented exercise into their daily routine. The implication being, if you want investors to believe your startup is viable, the information doesn’t just need to be semantically clear, it also needs to be visually easy to read, otherwise, it will seem too demanding. Why? “Processing fluency.” We don’t have unlimited brain processing power or mental RAM (Heard VCs have short attention spans? That means their L3 cache is really limited, so get to the point!). If something is written well and it’s easy to read, people are able to parse and process the information more easily and will feel more at ease with the thing that’s being described. If it’s too complex, even if it’s just the font that’s difficult to read, it starts taxing and even short-circuiting our circuits. You can only make one point on each slide. That message should be put in the title like a Cliff Note. Writing ‘Problem’ as the header does not help with this rule, nor the 5-second rule. If the message is that you are solving a problem… only no one is sure what it is, you are failing badly. Or… more text kills deck. Eh, I couldn’t think of something witty. Basically, extra text is the devil’s work. No one wants to read your essay, so they will read a little text and then decide what it all means. This is a regular example for me. I get someon every day sending me a LinkedIn message (first interaction) 400+ words long. I typically respond now…. ‘can you give me the short version.’ Yeah, I don’t even read the whole thing. It’s too much to process. Clearly, this means you have zero control over the message the investor is getting from your slides if they decide it is too much work to read and switch off mentally. And, space. Space is your friend if you want to make slides pretty. People need to know why and they love to know how. What is easy. What is lazy. There are two manners of illustrating market potential: top down and bottom up. Top-down says you found someone who said it, which is useful as you apply referential credibility. But it also says you haven’t done the work. You need to do bottom up to show you have done the work and build trust that you know your numbers (beyond the top line). You are explaining causality. That paints you as an expert. You can discuss your assumptions collaboratively and allow the investor to feel they are a part of the thinking. Sure, a rising tide lifts all boats, but your correlation doesn’t generate alpha. Your Stoic thought gets baked into this analysis. Don’t have anything in your pitch deck that you can’t totally back up nor talk to. Investors need trust. Once they hand over the cash it’s one big leap of faith. Nothing removes a hard-on faster than lack of trust, a sense you are inauthentic and ill-prepared. Don’t hide the risks in the business. You need to understand that fear is the biggest impediment to getting funding. Address the risks, bring them under the sunlight, talk them through and how you plan on dealing with them (yes, you need to have done the homework). Appendix slides create credibility. A lot of investment decisions can come down to whether or not investors think the founders are credible and believable. Were they lying, hiding things? Do they really know what they are doing, have they really thought things through? Having an appendix slide for all the main questions is proof that you have thought about things, you have thought about how to derisk the startup’s growth and execution, as well as you losing the investors’ money. If you have a slide for every question, it’s pretty impressive… of course, it is work you may not have time for. You do not have ‘one shot’ to communicate the opportunity. You do not need to write every little idea into you 60 page deck… Trust me, I was that guy once too! The visceral story is more important than communicating the total story. If VCs buy into the core of your story, you’ll have a load of time to tell the full version. But you won’t get that opportunity if you confuse and bore the hell out of them. This is not comprehensive. There are a lot of things pertaining to formatting I could add, for example. I’ve tried to compile a list of less obvious aspects of pitch decks and pitching that you won’t read elsewhere. 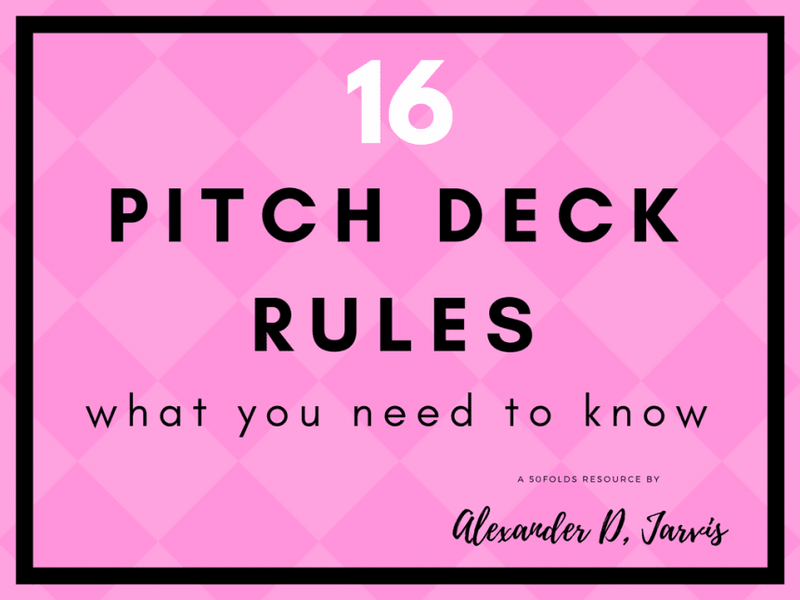 Hopefully, these pitch deck rules help give you an edge. If your stuck with your pitch deck fundraising, head over to Perfect Pitch Deckto get the support you need making a fundable deck. Sort out your pitch deck at PerfectPitchDeck.com. Blog at AlexanderJarvis.com. Build at 50Folds.com.